It’s been a reasonably uneventful summer so far (apart from our trip to Spain which was wonderful and friends visiting the UK from America!) 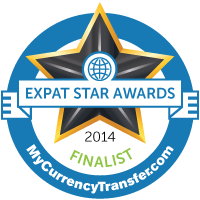 until yesterday when I was notified that Bringing Up Brits had won an Expat Star Award. So excited!! I’m right up there with the Gold, Silver and Bronze winners – two of which are blogs that I follow – Expat Woman, vegemitevix.com and 4 kids, 20 suitcases and a beagle. Bringing Up Brits is in the top 10 websites for expat women across the globe! See my award listing here and find out more about these awards by visiting their website. If you’ve brought your family along for the expat ride to Britain, bringingupbrits.com is essential reading. Whether you are looking for inspiring stories from other expats who have gone the distance or you need a little reassurance that it can be done, Bringing Up Brits will help you to keep your chin up and to maintain a stiff upper lip – all good things to have when moving onto British soil. And thanks to these awards, I have discovered other expat blogs which I can now follow. I just love reading other peoples’ stories and find it fascinating how much I can relate to them no matter which country they are in / from. I found this one particularly poignant for me. The Adaptable (Adopted) Expat Mommy and read this blog post www.laura-dennis.com/adoptee-memoirsa-growing-genre-need/ Which, for someone like me, an adoptee who has written a book that touches on the experience of being adopted, is a thought provoking post. So I guess this is sort of the end of my little ‘tea break’, although I’m not back in full force just yet! Enjoy the last few weeks of summer everyone.